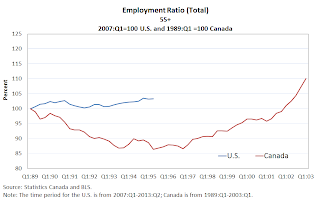 Is the level of employment in the U.S. currently too low? 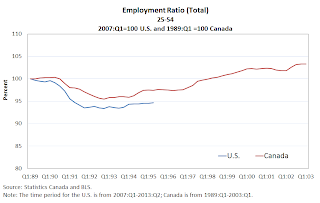 To many people, the answer to this question seems obvious: of course it's too low, you moron. 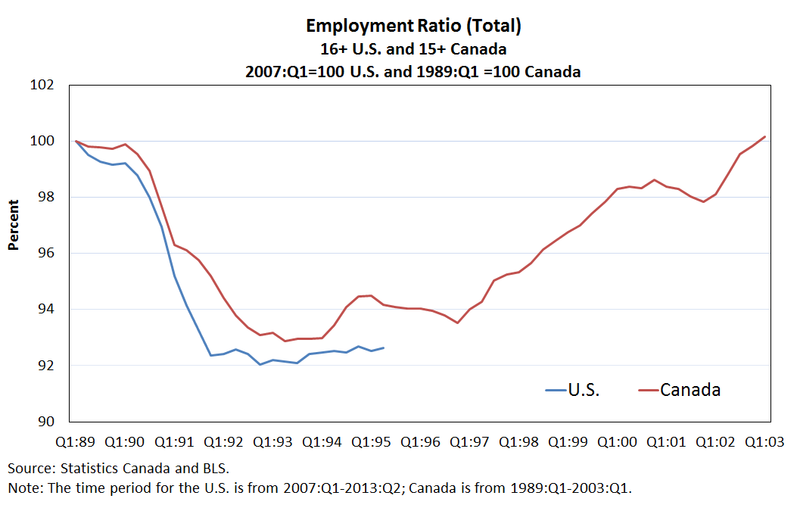 Maybe we can learn something by comparing the U.S. experience with Canada. 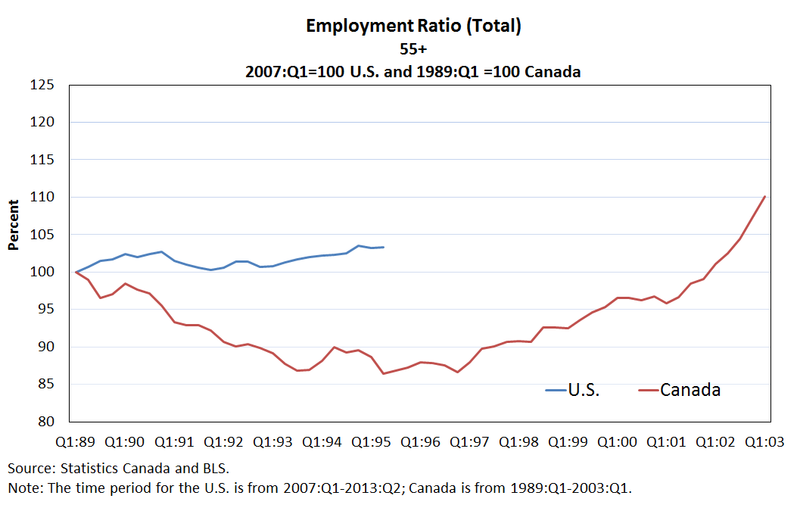 As far as different countries go, Canada is about as "close" to U.S. as one can get. 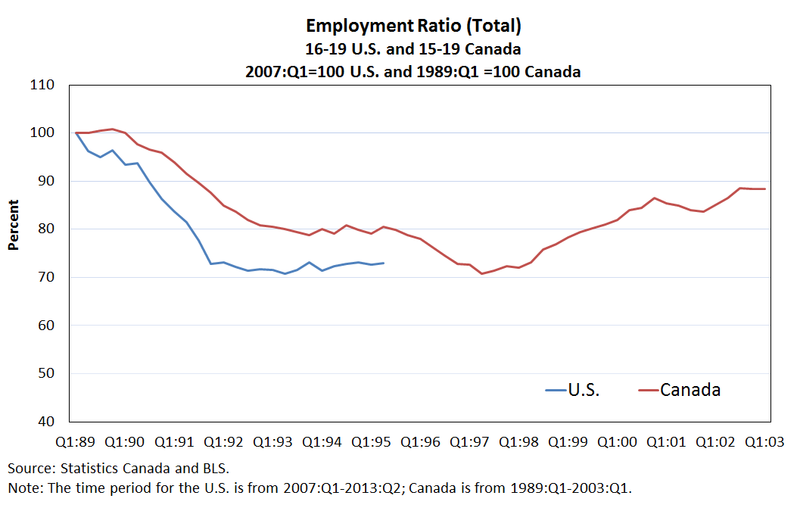 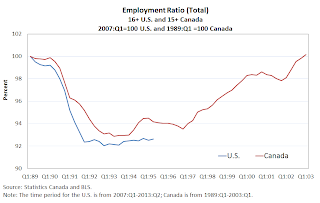 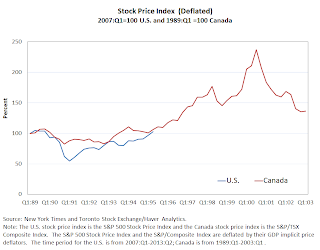 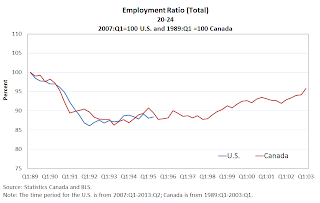 Moreover, as I've pointed out before, the Canadian economy experienced a great slump in the 1990s, a phenomenon that appears to be playing out now in the U.S.
Employment is similar early in the sample, but a gap emerges in the 1980s, growing even larger during the "great Canadian slump" of the 1990s. But for most of the 2000s, up to 2008, the employment gap appears to have vanished. 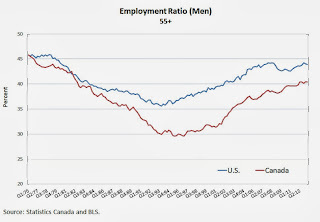 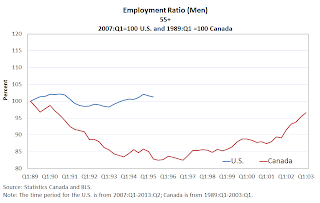 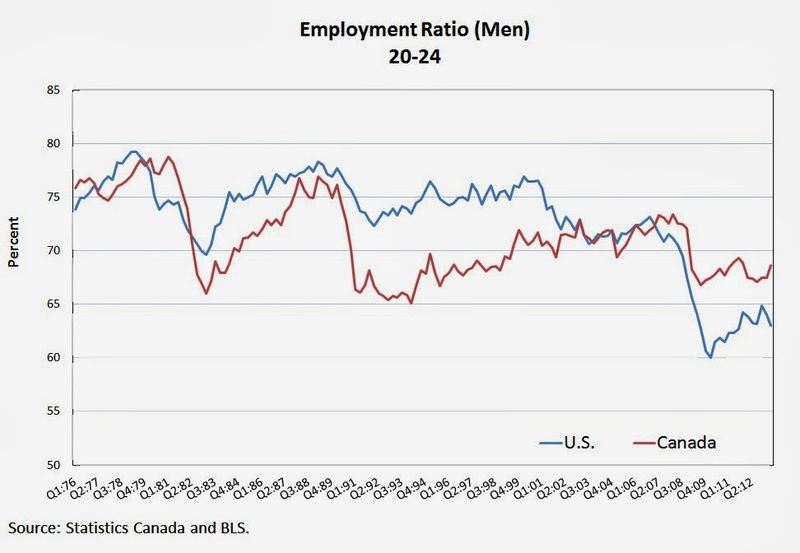 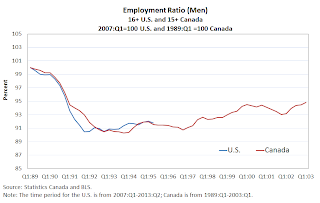 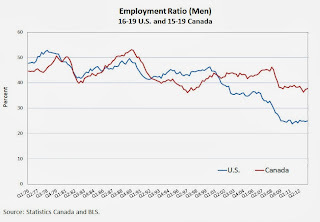 Since 2008, the employment gap has reversed itself: the employment rate among prime-age American males is now significantly lower (2 percentage points) than their counterparts in Canada for the first time in about 40 years. 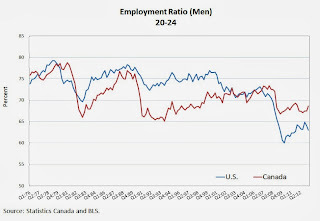 A lot of this employment must be in the form of part time work. 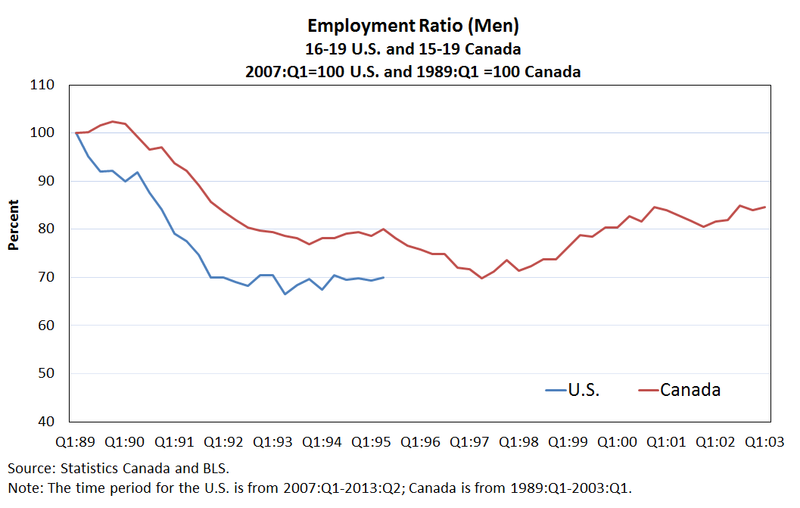 The employment ratios are low relative to other demographic groups, as one would expect, but the two countries are quite similar here until about 2000. What happened? 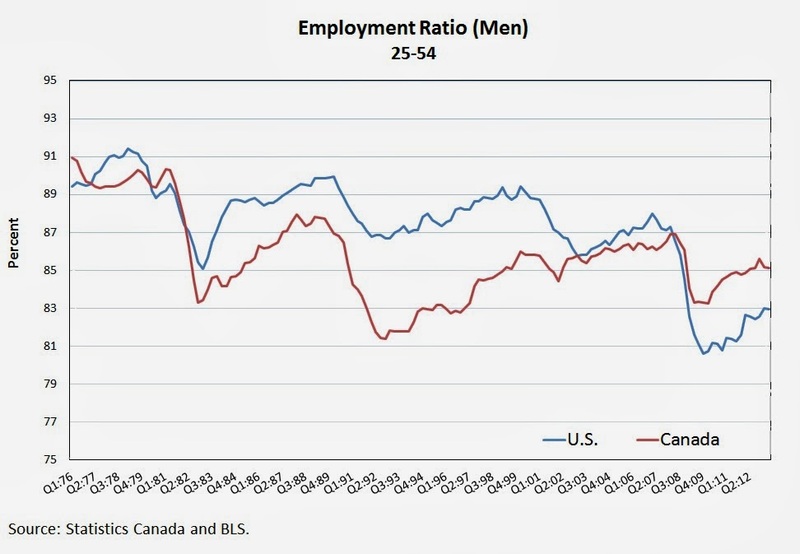 The picture here looks similar to the one for prime-age males. 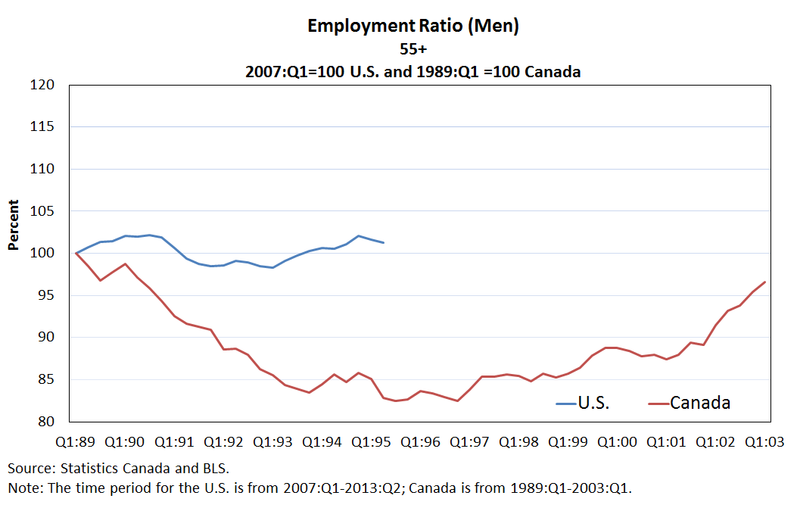 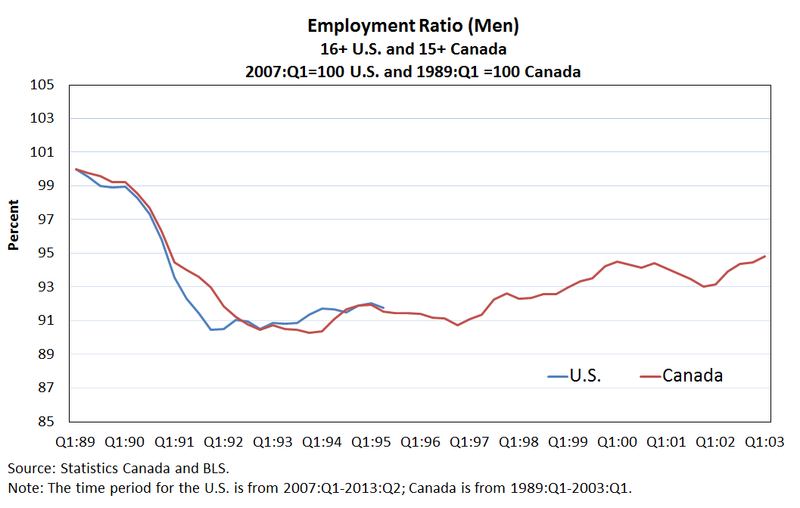 Together, the two pictures above show that the recent recession hit younger men in the U.S. harder than their counterparts in Canada, and also relative to older men in general. 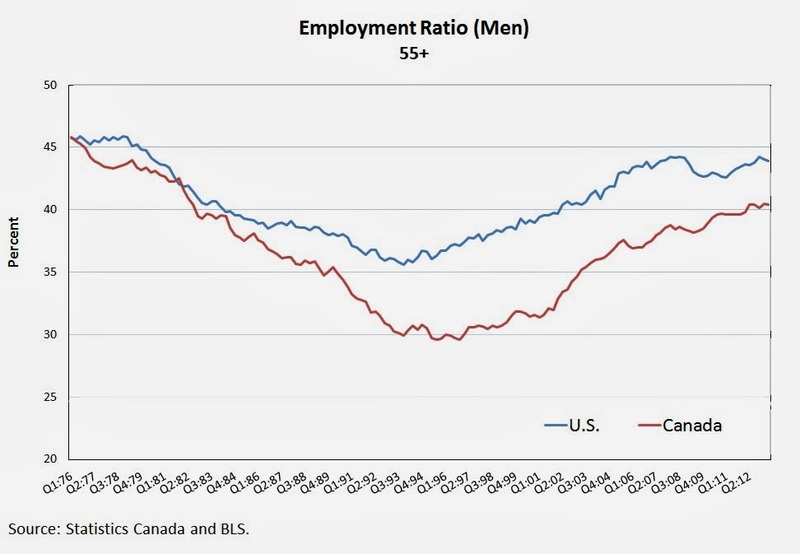 Evidently, older men are immune from negative aggregate demand shocks. Interesting. 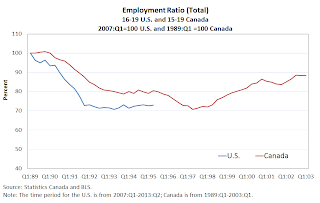 For most of the sample, the employment ratios track each other fairly closely, with the Canadian ratio slightly below its American counterpart. 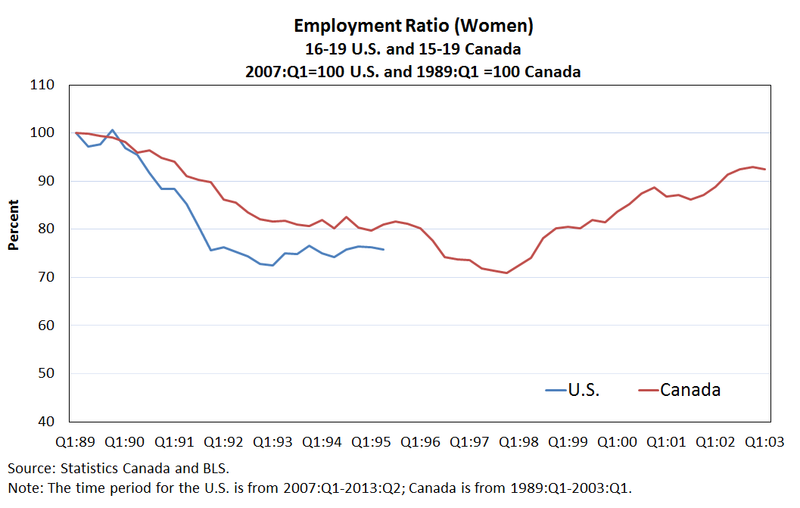 Again, as with teenage men, something appears to have happened in 2000. 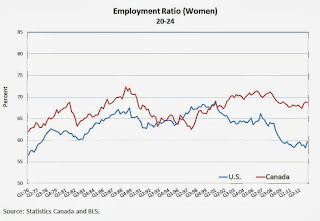 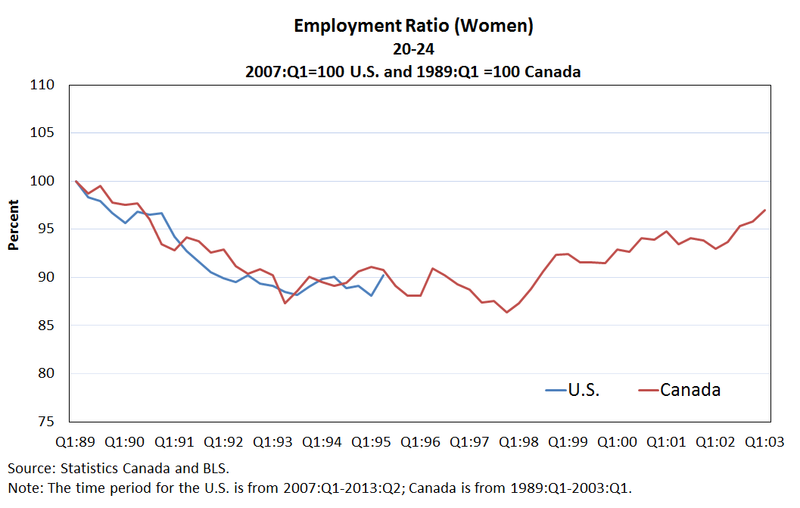 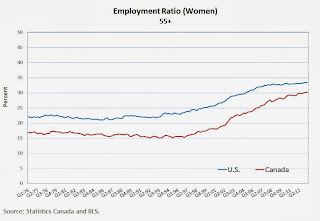 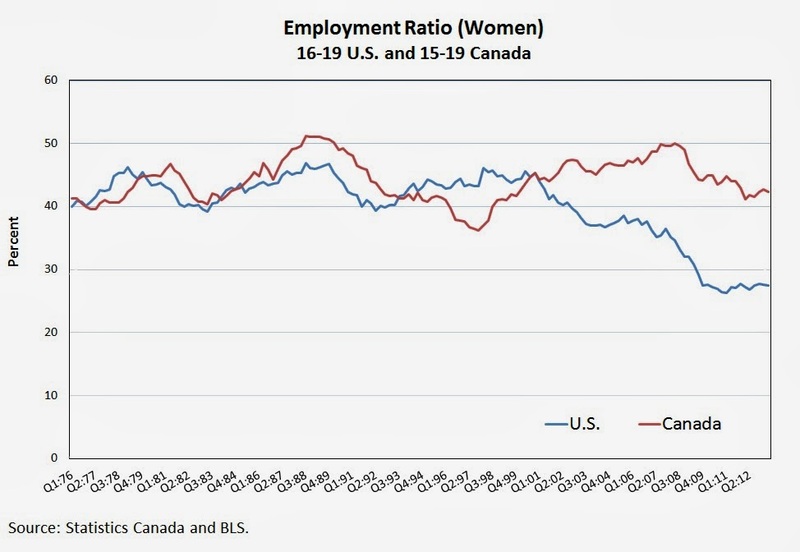 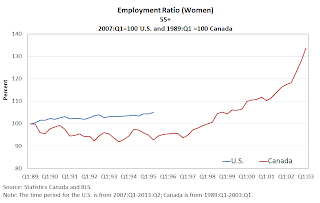 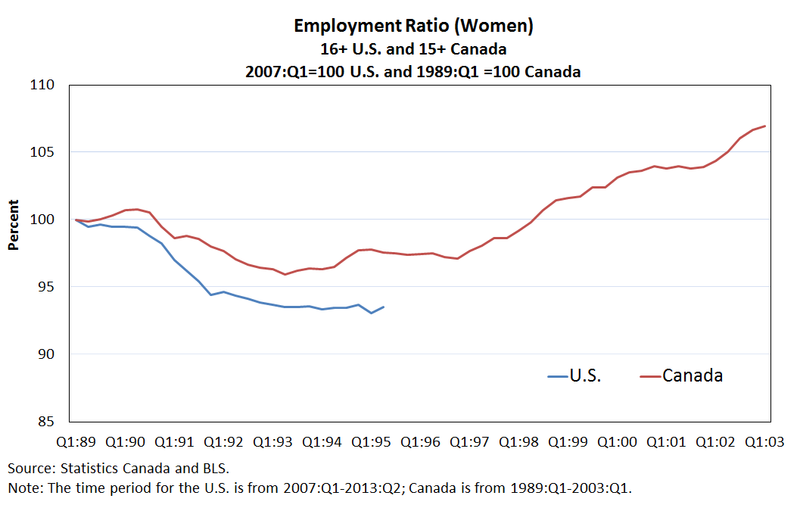 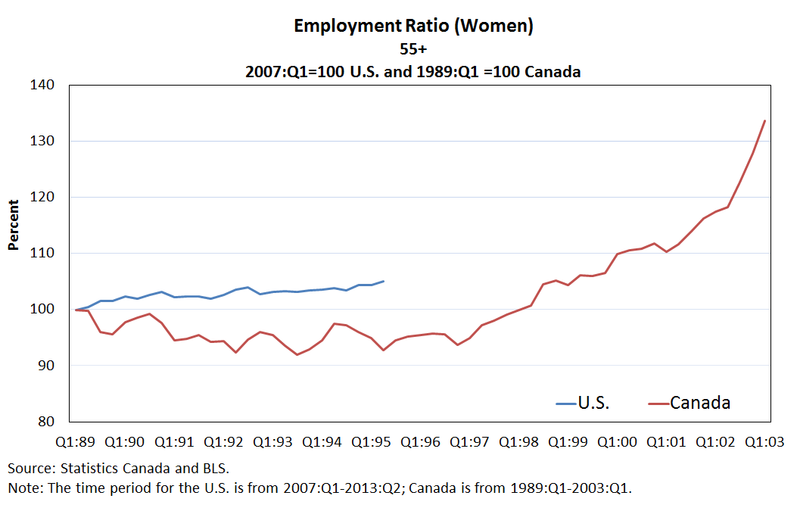 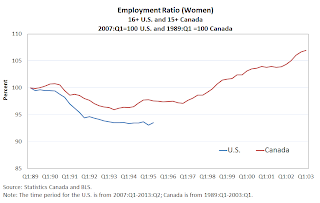 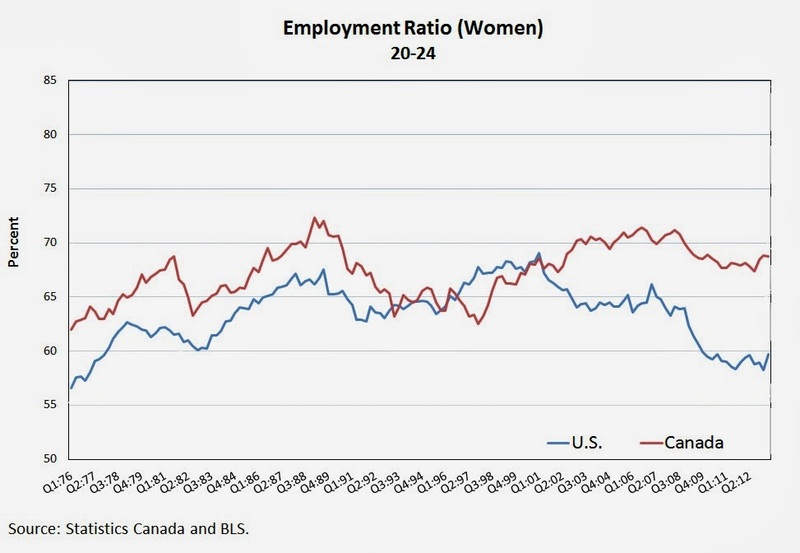 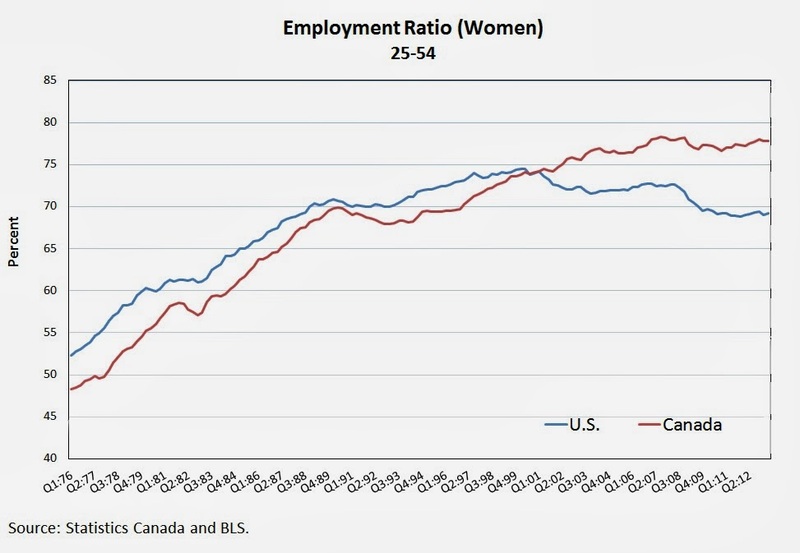 The female employment rate appears to be in secular decline while, in Canada, it has remained elevated and stable. 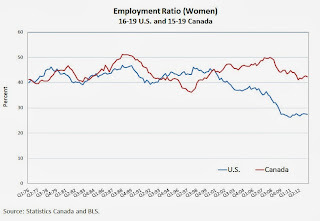 What are the implications of this recent divergence? 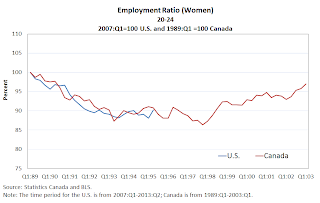 And how should it be evaluated by policymakers? 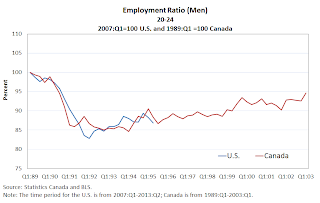 We need more data to answer these questions. 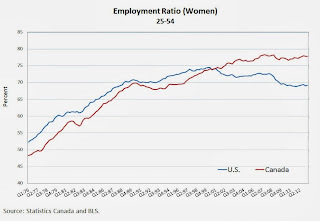 Here's the picture for teenage women. 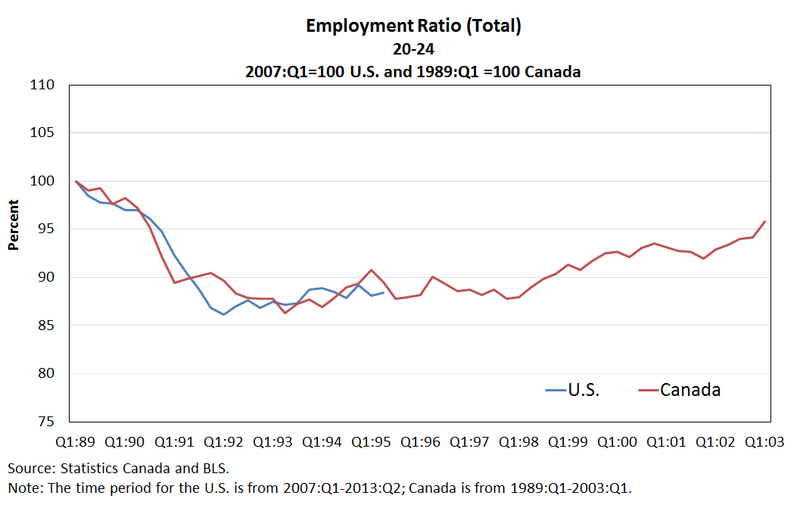 Again, a large cross-country gap emerges around 2000. 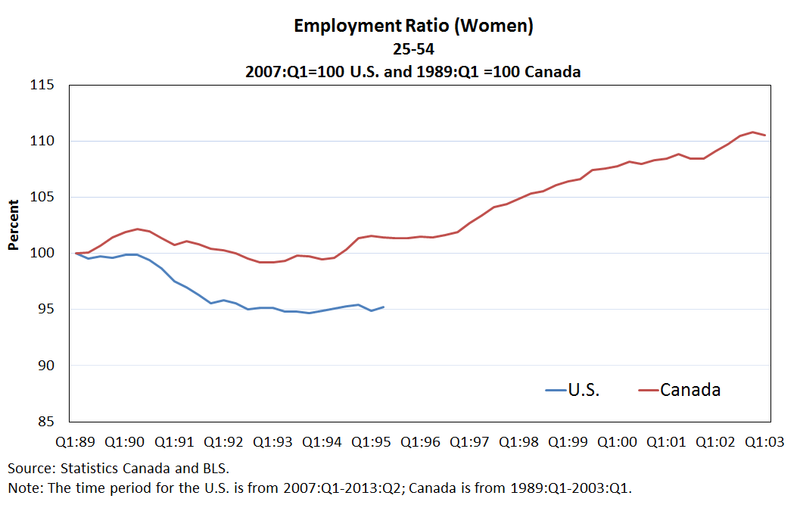 But once again we see a significant divergence across these two countries beginning at around 2000. 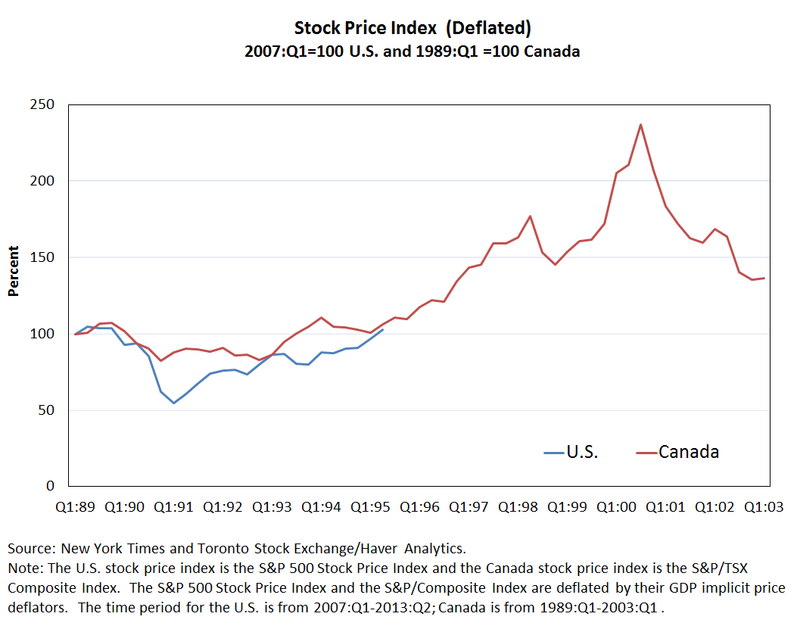 The recession in 2008 served to enlarge these differences. 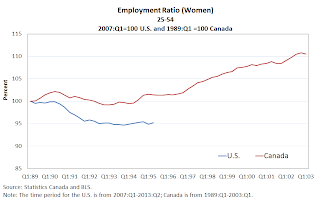 As with older men, older women seem largely impervious to the business cycle. 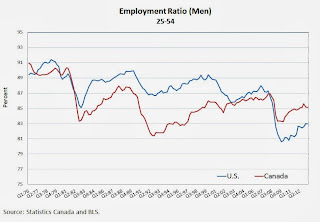 What is it that is leading older people to devote more time to market work -- seemingly at the expense of younger people? 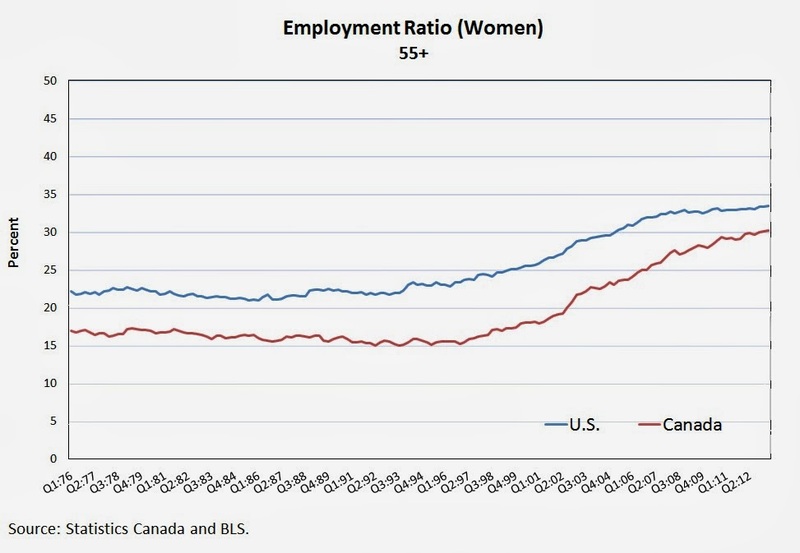 It is tempting to argue that the financial crisis, by wiping out retirement portfolios, compelled older people to work more to rebuild their lost wealth. 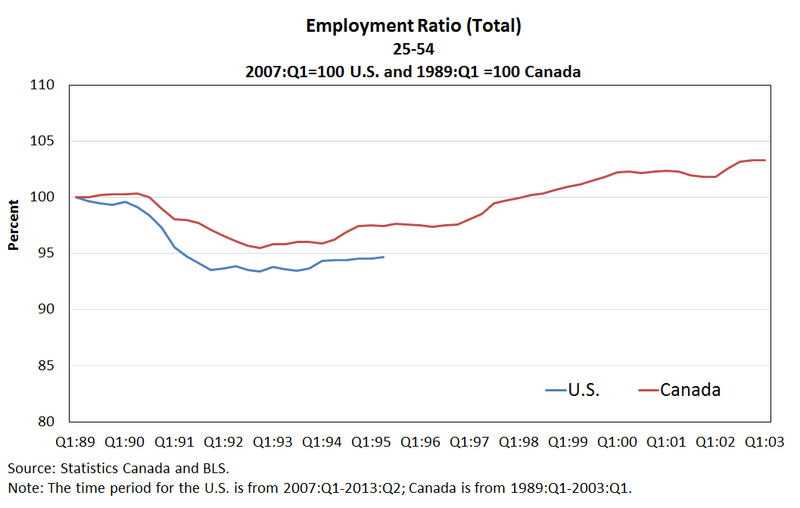 But the trends here appear to have been in place since before 2000.